In the case of conferred memberships (i.e. memberships bestowed on a contact "by relationship"), CiviCRM's Scheduled Reminders feature sends an email to all of the contacts associated with that membership: the primary contact as well as all the contacts with a "by relationship" membership. 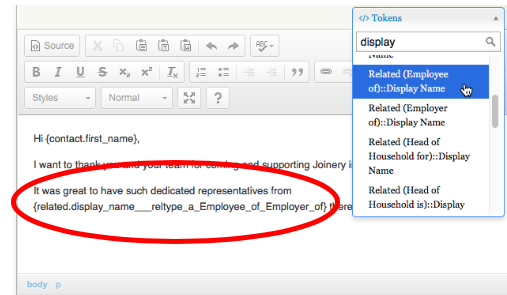 When standard email tokens are used in this instance, the tokens are populated based on the contact the email is being sent to, not the contact who holds the "primary" membership. This extension adds to CiviCRM’s list of tokens by creating new tokens that reference information from related contacts. For every existing contact token, such as display name or birth date, etc., the extension generates additional related field tokens for every enabled relationship type. Requirement was to be able to validate a checksum (from a mailing from CiviCRM) from an external website. There is a function that does that, this extension simply enables that function in the API. Required parameters: contact_id and checksum, returns is_valid:true or false in the values array. This extension deletes mailings that are unscheduled after a period of days specified. Normally, when you are working on a test/staging/development site, you don't want to have the mail option activated, so that you can avoid potential faulty email sending and/or spamming. For such cases, you usually disable the email sending functionality, by navigating to: Administer CiviCRM -> System Settings -> Outbound Email (SMTP/Sendmail) and switch to 'Disabled Outbound Email'. This extension allows you to view and respond to inbound SMS messages. To view, click on Mailings then SMS Inbox. Upon installation, this creates some extra data, that allows you to record if a message has been read or not. In addition, a message is displayed to the user if the message has been read or not. FlexMailer is an email delivery system for CiviCRM v4.7+. It does not define any user interface; rather, it replaces some internal parts of CiviMail and provides new APIs. Other extensions can use these APIs to provide more fine-grained control over email delivery. Composition: Change how email messages are composed. CiviMail has built-in support for simple tokens. With FlexMailer, an extension can change this in deep ways, e.g. This extension adds a new url civicrm/a/#/email/unsubscribe with the screen in the screenshot. It is intended to assist in data entry for unsubscribe requests. Deselect any actions you do not wish to take before clicking unsubscribe.